The sixty-fifth episode of the Yes Music Podcast featuring an interview with bass guitar guru and Chris Squire fanatic, Miguel Falcão. Listen to a real Yes fan and a fantastic musician, then let me know what you think by contacting me via any of the different routes on the right hand side or by leaving a comment below! What prompted Miguel to start recording Yes and Chris Squire bass covers on YouTube? What makes Chris Squire’s style so interesting? What other music does Miguel make and where can you find him? I’m very much looking forward to asking Tom what it was like to work with members of Yes on tour and also about his own music. So look out for the interview in the early weeks of 2013! Author KevinPosted on December 17, 2012 Categories Blog postsTags interview special, live, Magnification, Tom BrislinLeave a comment on Tom Brislin interview for Yes Music Podcast in 2013! 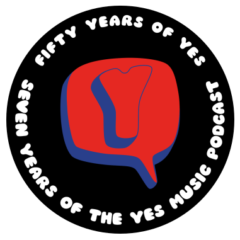 The sixty-third episode of the Yes Music Podcast featuring some Quite Interesting things from Tim Morse’s book, ‘Yesstories – Yes in their own words’. Listen and see if all you agree with me that these are Quite Interesting facts, then let me know by contacting me via any of the different routes on the right hand side or by leaving a comment below! The Danglers’ new album – listen, then buy it! If you would like to claim your YMP Listener Open Badge, send an email to show@yesmusicpodcast.com or fill in the contact form. The sixty-second episode of the Yes Music Podcast featuring the opening tracks of all the studio albums’. Listen and see if all you agree with my assessment of the way in which each album begins, then let me know by contacting me via any of the different routes on the right hand side or by leaving a comment below! Does the band use the same approach to all opening tracks? Does the opening track always set the scene for the rest of the album? Are all opening tracks equally as successful? Author KevinPosted on December 7, 2012 October 10, 2016 Categories Episodes, YMP Classic FeedTags 90125, Alan White, album, Ben Craven, Benoit David, Bill Bruford, Billy Sherwood, Chris Squire, episodes, Fly From Here, Geoff Downes, Igor Khoroshev, Jon Anderson, Keys to Ascension, orchestral, Patrick Moraz, Peter Banks, podcast, prog rock, progressive rock, Rick Wakeman, Steve Howe, Tales from Topographic Oceans, Time and a Word, Tony Kaye, Tormato, Trevor Horn, Trevor Rabin, YesLeave a comment on Episode 62 – Start as you mean to go on?